But I didn’t know all that when I first heard about Temple Grandin. It was simply the title of her book, Thinking in Pictures, that caught my attention. While I didn’t read the book at the time, that title grabbed me, and continued to fascinate me. I began questioning people I knew, “Do you think in words, or pictures?” My own answer was words, lowly boring words. Most people I asked also answered “words”, although one or two said, “both”. Before that, it had never occurred to me that anyone would think in anything other than words, but right away I saw that pictures must be how animals think. Well, early this summer I made the happy discovery of a horse book collector disbursing some of their collection on the Internet. Absorbing the writings of the modern and classical masters of riding and horsemanship, looking for written clues and insights to guide me in my never ending quest, is a bit of a compulsion of mine. At this sale I managed to score copies of Klaus Balkenhol’s biography, Success with Sympathetic Hands, as well as Nuno Oliviera’s classic, Reflections on Equestrian Art. 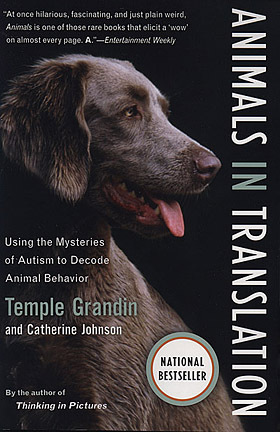 Also, and immediately relevant to the subject of this article, I spotted a copy of Temple Grandin’s book: Animals in Translation: Using the Mysteries of Autism to Decode Animal Behavior. Again the title jumped out at me, and I decided that here was a book that I simply must read. Animals in Translation seemed like a book that was written just for me, since I’ve always had a practical desire to understand animals: how they think, how they learn, and how I can better communicate with them. And I also have something of a fascination with the inner workings of the brain. As a result, I found this book hard to put down, and once I was done reading it, I turned it over and started again from the beginning (a hallmark of books that I love). Temple Grandin’s writing style is simple and direct. For a scientist, she doesn’t use a ton of big words or jargon, a trait that I value. The book starts out with a brief story of Grandin’s life growing up with autism, and moves on to her college experience in the 1960’s, studying animals and psychology. In those days the field was all B. F. Skinner and behaviorism, when scientists believed that all you needed to, or indeed should, study was behavior. You weren’t supposed to speculate about what was inside a person’s or an animal’s head, because you couldn’t measure all the stuff inside the “black box” of the brain, like intelligence, emotions, and motives. Some behavioral scientists back then took this idea to the extreme by teaching that animals didn’t even have emotions or intelligence, only behavior, which was shaped by rewards, punishments, and positive and negative reinforcements from the environment. Shaping behavior in this way is called Operant Conditioning, and is still the way that most animals, including horses, are trained. However, today people recognize that there is much more to animal learning and animal behavior than just environmental shaping, and we recognize that animals definitely do have their own emotions, motivations, and instinctual hard-wired behaviors. The single worst thing you can do to an animal emotionally is to make it feel afraid. Fear is so bad for animals I think it’s worse than pain. I always get surprised looks when I say this. I was not the least bit surprised when reading this statement, as I predict none of my own readers will be. If you work with animals, especially prey animals like horses, you know how much more significant fear is to them than pain. Horses can mask pain, even intense pain, like crazy. They can be in the middle of a serious medical episode and yet, when you check on them, they look totally unconcerned, and are even eating like everything is just fine and dandy. Most of us have learned to monitor signs like respiration rate, heart rate, and skin temperature to give ourselves clues to how much pain our horses are actually in, if we suspect that something is not right with them. Fear, on the other hand, especially intense fear, is almost debilitating to horses. They can’t think of anything else, can’t learn, and basically can’t function in the face of intense fear, except to try to distance themselves from the object of their fear. Fear and pain is an area where people differ from animals, in that if you asked most people to choose between experiencing intense pain and intense fear, most people would choose fear. Grandin says that is because normal people have a lot more power to control their fear than animals do. This is due to different levels of frontal lobe function. Normal humans have much bigger frontal lobes than animals (while autistic people also have normal human-sized frontal lobes, they have reduced frontal lobe function). Studies show that an active prefrontal cortex is associated with reduced fear. It is also associated with increased pain. So, animals and autistic people have higher fear and lower pain. While the fact that our human frontal lobes give us more ways to manage our fear didn’t really surprise me (just think of all the ways that we have to distract ourselves from and/or rationalize our fear), it did surprise me that our large frontal lobes would result in a greater experience of pain. After their operations, leucotomy patients stopped caring about their pain. They kept the pain, but lost their suffering! I think that’s amazing. Our large frontal lobes are said to be one of the things that “makes us human”, and apparently part of that function is to build an experience of suffering around the sensation of pain. On my yoga DVD the instructor sometimes says, “Nothing has meaning unless you give it meaning. Whatever you’re experiencing on the mat, it is just sensations.” After I read this story I saw what he was getting at. I’ve even tried this approach on myself when I have pain (not from yoga!) I tell myself, “I feel the pain, but it doesn’t bother me.” Strangely, this does help. While we’re talking here about an unconscious function of the frontal lobes, it seems to show that we do have some conscious ability to influence the story our brain is constantly creating for us to make sense of our sensory experiences. Although I already knew that a horse’s experience of fear certainly seems more profound than a human’s, I now have more of an appreciation of why. And reading this also made me think that, through training, we humans can provide for the horse some of the same functions that our frontal lobes provide for us. That is, a way for him to understand, rationalize, and make better decisions in the face of fear, to better cope in our human-centric world. Recently I’ve been experimenting with operant conditioning using positive reinforcement to do exactly this, and it has been an interesting exercise with rather amazing results which I plan to share in a future article. This post just touches on one of the many anecdotes, observations, and theories of how animals learn and think that are covered in this useful book. If you are interested in animal learning and how the brain works, I really recommend reading Animals in Translation. The book gives an interesting and thought-expanding look at both the science and practice of animal behaviorism, as well as a fascinating glimpse into Temple Grandin’s life. Hi Lori! I LOVE your weekly articles. I LOVE your outlook on horses and life. Thanks so much for sharing!!! Great summary of Grandin/psychology/behavior. Have you seen or read anything by Dr. Jill Bolte Taylor? She has the most amazing 20 minute talk on ted.com and her book, My Stroke of Insight, might interest you based on your passion for learning and the brain and inspiration. I am off to take my kids to school but just wanted to give a shout of thanks to you this morning. I’ve found value in every one of your articles. WOW! Great blog. I have been interested in behavior (any behavior) since I can remember. I discovered Temple Grandin several years ago, and have read both “Animals in Translation”, and “Animals Make Us Human”. Both good books for thought and guidance when we are perplexed and amused at behaviors. Guess I will have to go out and get “Thinking in Pictures”. As far as thinking goes, mine has always been done in pictures. Even when I can’t remember a word, I have to “see” it spelled in my head to remember it. I have never been good at learning a foreign language. I feel dyslexic when I look at it in written form. “What do all those misspelled words mean?” Anyway, about five years ago, I started learning American Sign Language (ASL). It is a beautiful, visual language. I now interpret for our church on Sunday mornings. ASL has been especially helpful for me when trying to remember a word. I sign it, then I can say it. I have been using Clicker Training, a form of Operant Conditioning, on my horses for about 3 years now. Once they realized I wasn’t a Pez dispenser, they took learning seriously. It’s fun, user friendly, and very amusing to see solicitous behavior. I always tell them what good boys they are when they solicit, but ignore the behavior and ask for something else. Be careful not to let your horse train you! I really look forward to reading your blog every week, even though I don’t always comment. Thank you for all your hard work and good information. Another great article – thanx. I definitely think in pictures and have used visualization all my life to do Math (a technique they now teach in school) and in business to sort out HR issues. You need to be able to think in pictures to be able to visualize how someone else sees a situation and I now use this process with my horses, to visualize how they are viewing me and what I’m asking them to do. I also react to pain killers in the same way as the man who had the leucotomy! My second child was born by cesarean section – after which they gave me a shot of demerol and I remember thinking “Oh! Isn’t this funny, I’m in so much pain – ha! ha!” -No one (including me) could understand it – but now – thanks to your article I do! You guys! It does my heart such good to read your comments. Thank you. Elizabeth, that is exactly what I like, I loved reading Jill Bolte Taylor’s book (and her TED talk). The part where she’s having the stroke and in the shower and can’t discern where her “self” ends…. Wow. Toni and Libby, do you think you could TEACH me to think in pictures? Like a second language perhaps? It just sounds fascinating (and useful). I also started clicker training, I wanted to compare positive vs negative reinforcement in effectiveness of training and speed of learning. I’m VERY impressed. I kinda didn’t think it would be good for Fjords because they can be mouthy and pushy by nature, and I don’t like that behaviour, but that is the first lesson and it works fantastic, I guess because they are also SO smart. This is the first time I really felt as though I was tapping right into the horse’s own motivation to learn. It feels like he wants to solve the problem as much as I do. Clicker training, I have to laugh. I have to work with Tunix’s mind to get his motor going…I understand him completely because I am slow to get going too, sigh. Anyway, once I get him cantering I cluck to him (I dropped the clicker to use a cluck with my tongue, the horses learn very quickly & I don’t have to carry a clicker around). After I give him his reward, he really wants to canter! Of course I mix it up and do a variety of things, but the “click” and reward energizes his “draft” horse mind and body. If Tunix could write, he would have a sign and would stand at a freeway exit (like panderers do in Calif) with a sign that says “Will work for cookies”! great article. I’ve read most of Temple Grandin’s works, since I have an autistic grandson and it has helped me understand both him and my husband, who is probably borderline autistic. Joe thinks in pictures. His PhD is in Mathematics (abstract algebra) and I am a word person with a degree in languages. Communication has always been a challenge for us (married 53 years!) and that is partly because of the differences in the way we process our world. It is extremely helpful and enlightening to try to put oneself into the other’s shoes, so to speak, and to work on appreciating the differences as well as the similarities in the way both we and our animals process the world around us. I find as I get older, and as I have worked more and more with “critters” that I am able to visualize/think in pictures to some degree. Maybe it is a bit like learning another language. There is a different “syntax” in pictures . . . Anyway, thanks so much for the variety of stimulating thoughts and issues you bring to us in the process of working with our Fjords.